Eveslage Estate Auction — Harritt Group, Inc. Selling the lifetime collection of Frances Eveslage & her late husband Richard including tractors, equipment, trailer, antique furniture, advertisement, musical items, vintage toys, vintage auto parts & accessories, shop tools, antiques & collectibles, modern furniture and household items. Auction located just 1/10 mile East of Hwy.150 near Floyds Knobs Water Tower. Massey Ferguson 1233 4WD compact tractor, 1950’s International McCormick Cub tractor with Woods belly mower & plow, 3-point finish mower & 16’ tandem flatbed utility trailer, (2) as-is Honda riding mowers, lawn sprayer, lawn cart and more. 1900’s 6-foot back bar cabinet with beveled glass doors from the old Jitney Restaurant in Floyds Knobs, grain painted 2-piece cupboard, early blue painted 12-tin pie safe with scalloped base, oak 26-drawer letter cabinet, Globe-Wernicke 4-stack barrister bookcase, mission oak rocker, folding oak high chair/rocker, oak lamp table w/large claw feet, oak round stand table, waterfall vanity, mahogany bookcase, porcelain top work table, assorted chairs and more. Purity Maid Ice Cream porcelain 24”x12” sign, Krogman Est. 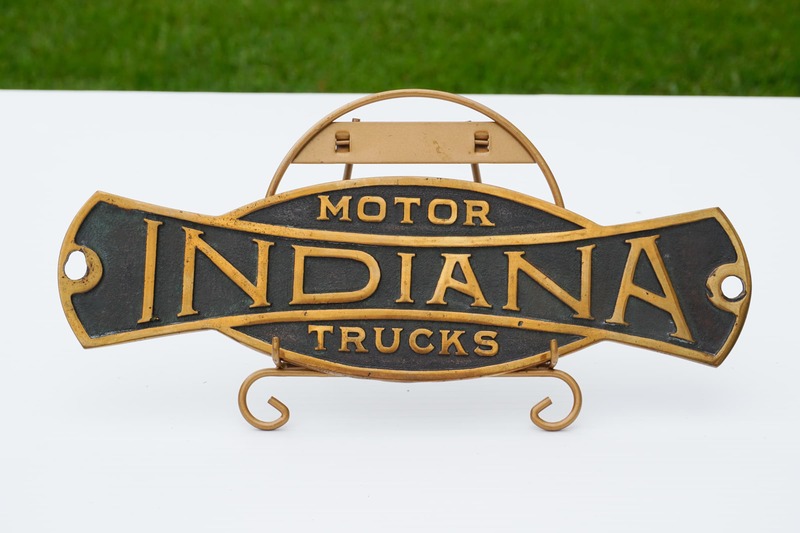 1863 1/2 gallon jug, Red Goose Shoe ad, 5-cent Coca Cola key fob & button thermometer, brass Indiana truck emblem, Atlas wiper blade thermometer, Morse Cutting Tools Louisville KY sign, Sealtest milk crate, old advertising tins, (2) Contain Lead porcelain gas pump signs and more. AMI 120 Juke box, Victorian pump organ, Edison cylinder talking machine, cylinder rolls & 1914 Conn saxophone. Lumar A&P semi truck, Buddy L sit-n-ride tow truck, metal toy trucks, cast iron trains, cars, animal banks, farm wagon, tractors, vintage Mickey Mouse & Donald Duck, windup bear, monkey, dog, penguin & elephant, rocket bank, cast horse & fire wagon, miniature ice cream maker, die cast collectible cars & trucks, Oliver disc & baler, IH toy tractors & implements, toy semi trucks and more. Rare Boyce 1918 Motometer radiator cap, polished brass Schebler Carburetor from Indianapolis, porcelain car pins & badges, rare 1914 Miller-Chapman auto theft signal wheel lock, brass steam engine oiler, Ford Model A lamps, grills & trunk boxes, air horns, coils, radiators, steering wheels, spot lights, car emblems, shop & auto manuals, 1920’s & 1930’s Indiana license plates, old Jeep engine, as-is Mullins trailer, Popular Science & car magazines and more related items. Power Back 5250 watt generator, Central Pneumatic steel blaster cabinet, heavy duty compressor, Walker-Turner drill press, Craftsman band saw, scroll saw, welder, large Wilton vise, floor punch, large wood top work bench, large selection of hand yard & power tools, pipe wrenches, air tools & sprayers, multi-drawer bins, organizers, electric motors, clamps, floor jacks, levels, copper pipe, scrap iron, heavy duty shelving, battery chargers, jump box, shop supplies, nuts, bolts including entire contents of garage and pole barn. Small counter top oak showcase, iron balance scale, Simmons Hdwe. lard press, Dazey metal butter churn, cast iron kettle, Champion cast iron implement seat, oil cans, ammo box, oak wall phone, vintage cameras & movie projectors, traffic light, sprinkling cans, industrial stool & lamp, ornate 1900’s brass table lamp, Hart Hardware Louisville, Ky dinner bell, wall regulator clock, Jart game, White Mountain ice cream freezer, (3) gold filled pocket watches, Sandoz-Vuille 8-day Swiss made pocket/car watch, Hoosier Knobs Car Club watch & collectibles, Roseville & Hull vases, geode rocks, wagon wheel, large selection of glassware & china, Purity Maid, Kannaple, VonAllmen & Oscar Ewing milk bottles, sled, New Albany & Wennings lard tins, wash boards, hen-on-nests and more. Maple dinette, (2) Keller maple hutches, wicker sofa, arm chair & ottoman, leather sofa & chair, full size bed & maple chest, sleigh daybed, Keller 100th Anniversary rocker, curio cabinets, kitchenwares, small appliances, jars, gas grill and more common household items. I-64 to Hwy. 150 Greenville Exit#119. West 2 miles to right on Paoli Pike across from Mt. St. Francis. 1/10 mile on left.